This week, we are continuing the unit studies that we have been working on. The kids are loving the autumn themed units especially. I am expanding the units a bit to include more science and hands-on. One worksheet that I am setting up for Little Miss is a leaf identification sheet. I am finding pictures of various leaves online and placing them onto a page in my word processor program, then adding a space under each for her to write the name of each leaf. For Pookie, I will have leaf color sheets printed from the Internet. I am having fun (as they are also) in finding little extras to add to their workboxes. With the amount of fun they are having in learning about autumn and the changes it brings, I am thinking ahead to pumpkins. Both kids enjoy most the subjects that are nature related. Recently, Little Miss started asking to learn more about pumpkins. How can I say no to that? It is near time for me to buy the pumpkins for canning and to make pies with for Thanksgiving. Seems like a great time to start teaching about the pumpkins. I found a really neat book at the library. 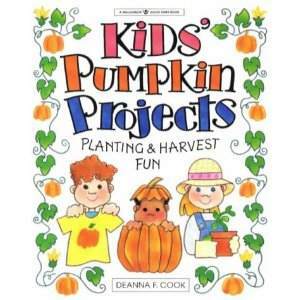 “Kids Pumpkin Projects: Planting & Harvest Fun” by Deanna F. Cook, is filled with great activities for young children. each activity is designed to teach children about pumpkins in a way that is meaningful to them. First, they make a pumpkin journal in which to record their observations as they plant, grow, and harvest their own pumpkins. Throughout the book, the children are learning about pumpkins in a way that makes it exciting and fun. From planning their pumpkin patch, seed shopping, and planting, the children learn what a pumpkin plant needs to grow properly. During the growing season, they are making notes in their journals as well as other activities. A simple one that is very educational is making a pumpkin family tree. They learn that a pumpkin family includes all types of squash and gourds, which are broken down further into groups according to type. The book includes crafts and recipes to use with your harvested pumpkins. It is such a fun book, that I am going to be ordering ourselves a copy this week. I will be starting some of the activities out of order. I already have organic pumpkin seeds. We like to save seed from one harvest to plant the next season. Among the seeds are some gourds and various types of summer, autumn, and winter squash also. We can start by making a seed chart comparing the seeds. Later on this winter, we can follow the book more closely and start our seeds in late February in little cups indoors to transplant when frost has passed us by in spring. Little Miss becomes so excited about watching her own garden plants grow. This will be a great long-term project for her. Even Pookie may enjoy it!